Detailed Description: Schneider Electric/Square D Miniature circuit breaker with shunt trip has box-type lugs to accommodate 8 - 2 AWG aluminum/copper wires. The 2-Pole circuit breaker has voltage rating of 120/240 VAC, current rating of 40 Amps and short-circuit current rating of 10 kilo-Amps. Miniature circuit breaker has two-spaces and mounting bolts to hold the breaker in place. It has shunt trip feature that can trip the breaker externally under over-voltage conditions. Standard size circuit breaker is ideally designed to offer superior overload and short circuit protection. 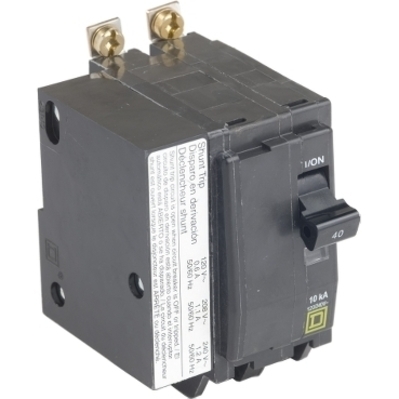 Circuit breaker is suitable for HACR rated applications. It measures 1.500 Inch x 2.910 Inch x 3.120 Inch. Miniature circuit breaker is UL listed and CSA certified.